Lock in a great price for Eloprogo Art House – rated 8.6 by recent guests! The owner is friendly, he showed us his painting gallery and took us around the property. 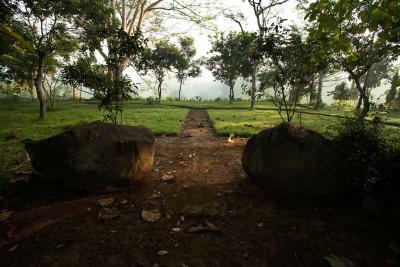 The place is suitable for the people who like nature and art. 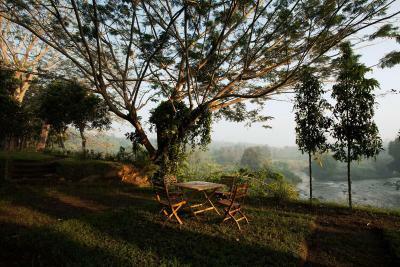 A beautiful and special place along the river just after the Elo and Progo rivers join. It felt like Rivendell from Lord of the Rings, with buildings designed by a Javanese Frank Lloyd Wright, inspired by the natural contours and elements of the land and brimming with art, whimsy, and creativity. There are all kinds of special nooks to enjoy the river and the architecture. Sony Santosa, the painter/philosopher behind the Elo Progo Art House, and his hospitable wife and kids make you feel so welcomed and attended to. I ate delicious food and very much enjoyed the chance to observe Sony's work. And they provided a sweet bicycle and helpful map that got me to Borobudur bright and early under my own steam. A truly magical place. Home like always. Coming home to myself every time am here. I stay here whenever possible. 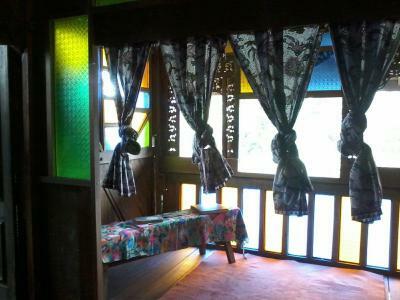 This is an art house, not just an accommodation. Sony and his wife have been so kind all the time. 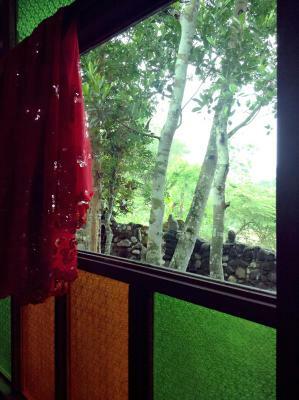 Magical grounds, sleeping next to a roaring river, close to nature, 10 minute bike ride to temple and town. It was an unexpected experience. My daughters enjoyed a lot to stay there. If you want to give your children an extraordinary experience, it will be highly recommended. 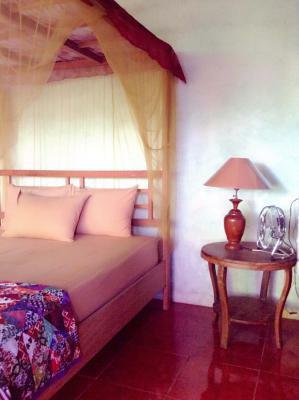 No mosquitos, the place is just right to have leisure time and the ambience are just perfect to get a rest there, the room doesn't have any aircon but the air there has already cool. The staff and everything really help the guest. All of my friends love to stay there. Sony and Nur as the owner really help and kind to us. No other place has had me leaving with tears in my eyes, and a whole new outlook on life. That is what Sony did for us, after our three days spent with him and his family. We WERE family. To have the opportunity to connect with an exceptional artist that he is, and be surrounded in his passion that is his art, in a place that is indescribably beautiful - I have no other words than to say BOOK IT! 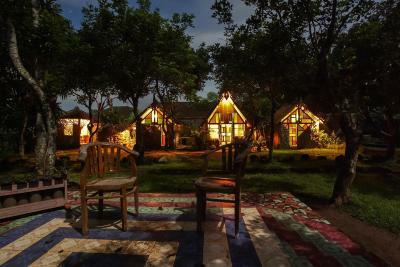 Most places that are located in such attractive surroundings lean on the location alone, and let other services slide, but Sony and his wife Mur made us feel part of their own, and went way beyond their means to ensure we had the best experience. After one month in Indonesia, Mur's most generous, mouthwatering meals win! Never have I experienced such an incredible place - not sure anywhere would beat it either. Eloprogo Art House This rating is a reflection of how the property compares to the industry standard when it comes to price, facilities and services available. It's based on a self-evaluation by the property. Use this rating to help choose your stay! 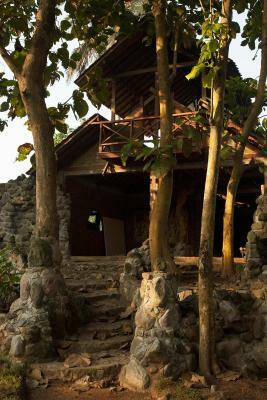 Nestled within lush natural greenery, Eloprogo Art House is located in a quiet village 15 minutes' drive from Borobudur Temple. Arts, adventure and nature are offered along with free use of bicycles and an on-site restaurant. 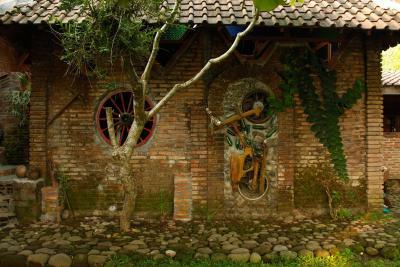 Eloprogo Art House is a 35-minute drive from Magelang City, while Yogyakarta City and Adi Sucipto International Airport are both a 90-minute drive away. 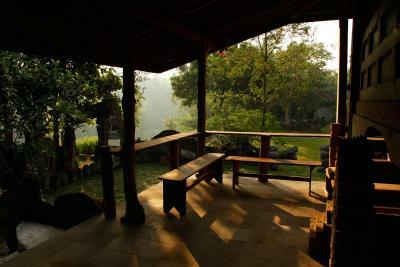 Overlooking the gardens, all units feature unique architecture built with natural materials. Some units come with a private terrace and a simple kitchen. 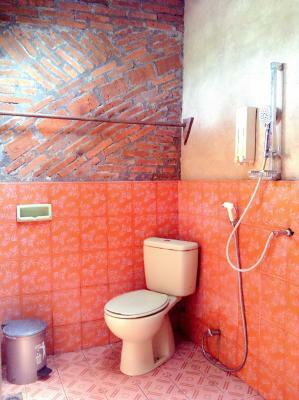 Shower facilities are available in the shared or private bathrooms. Staff at the 24-hour front desk can assist with laundry requests, airport transfers and car rental or area shuttles. 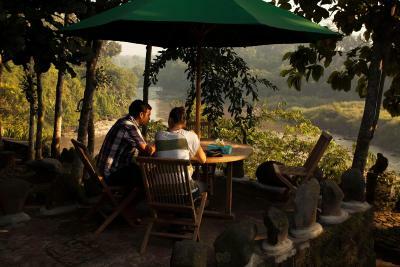 Activities like painting lessons, yoga classes, rafting or village tours can be arranged upon request. The restaurant specializes in Indonesian cuisine and offers room service. 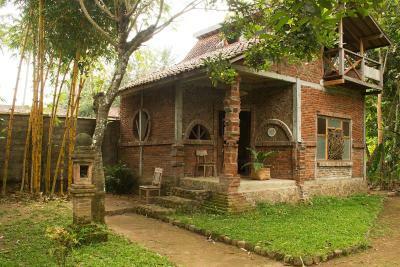 This property is also rated for the best value in Borobudur! Guests are getting more for their money when compared to other properties in this city. 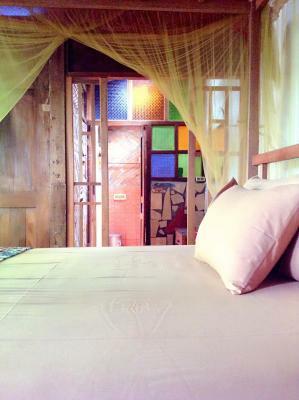 When would you like to stay at Eloprogo Art House? Overlooking the garden, this room comes with a fridge. The shared bathroom comes with shower facility. 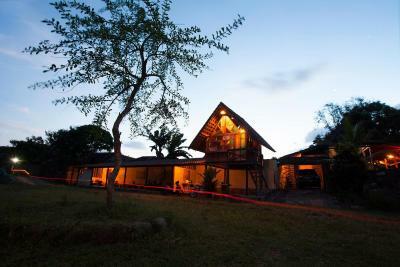 Suitable for up to 4 guests, this spacious bungalow comes with a private terrace overlooking the greenery. It also has a simple kitchen and a seating area. Shower facilities are available in the private bathroom. This bungalow has a balcony. House Rules Eloprogo Art House takes special requests – add in the next step! Eloprogo Art House accepts these cards and reserves the right to temporarily hold an amount prior to arrival. Please inform Eloprogo Art House of your expected arrival time in advance. You can use the Special Requests box when booking, or contact the property directly using the contact details in your confirmation. The property should be taken care more professional to attract people to come back. Not for someone looking for luxury and AC. It does have hot water, however and is very comfortable. 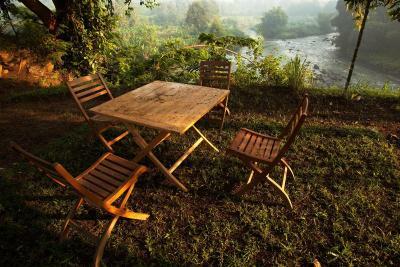 The beauty of the location, high above the river, with a garden to relax and enjoy. The owner, who is an artist, who was extremely welcoming and interesting to talk to. His wife is a very good cook and they catered well for me being a vegetarian. Delicious breakfast and supper every day. I loved the aesthetics of the surroundings. A short cycle ride to the main sites. A very easy place for a solo traveller. You feel part of a family. It’s pretty much eco. Thus there is no ac and some insects can show up. But as it is beautifully integrated into the nature that’s ok. 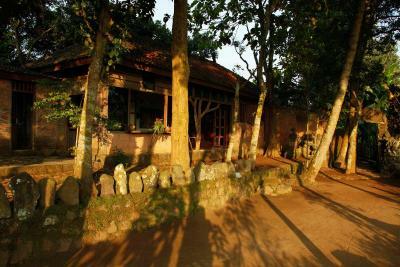 The guesthouse is located in a magical spot with view over the river and volcanos. 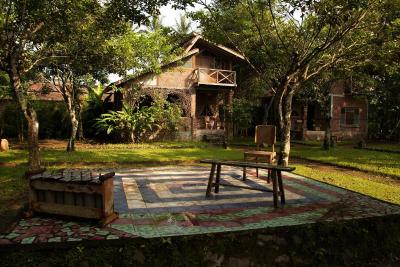 The garden and houses are elaborated by the artist with lots of love to the Detail. The team was very helpful with the organisation of trips and transfer. There is a possibility to also get lunch and dinner which was great but a bit pricey. The rooms could have been cleaner and at least the bed done and trash emptied every day. The sound and view of the river was amazing. The friendliness of the staff was amazing! And the food was very good. 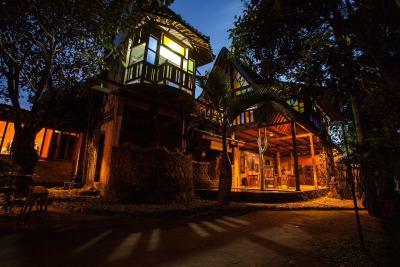 Absolutely magical architecture and art by the visionary owner on an incredible, isolated, expansive riverside location. We stayed here as a family with 2 teenage daughters and loved it. We want to agree with many of the positive sentiments made in other reviews. 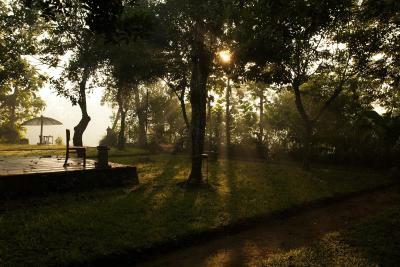 This is truly a beautiful and peaceful place. If you can’t relax here, then you won’t be able to anywhere. Moor’s cooking is out of this world - nourishing, full of a variety of flavours, and it gives you an insight into traditional cooking...just like being in someone’s home. Sony has such a creative mind and with this has turned a vision for Eloprogo into a place that balances being close to nature with some simple comforts. 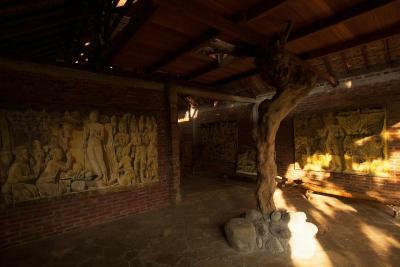 The place itself is a work of art with interesting design elements everywhere. Riding bikes through the village and to the nearby temples was a real treat. We used a local driver arranged by Eloprogo (Noor) who was friendly, accommodating and spoke good English. He assisted with our transfers between Jogja, and also to see local sights and activities eg. making Batik. 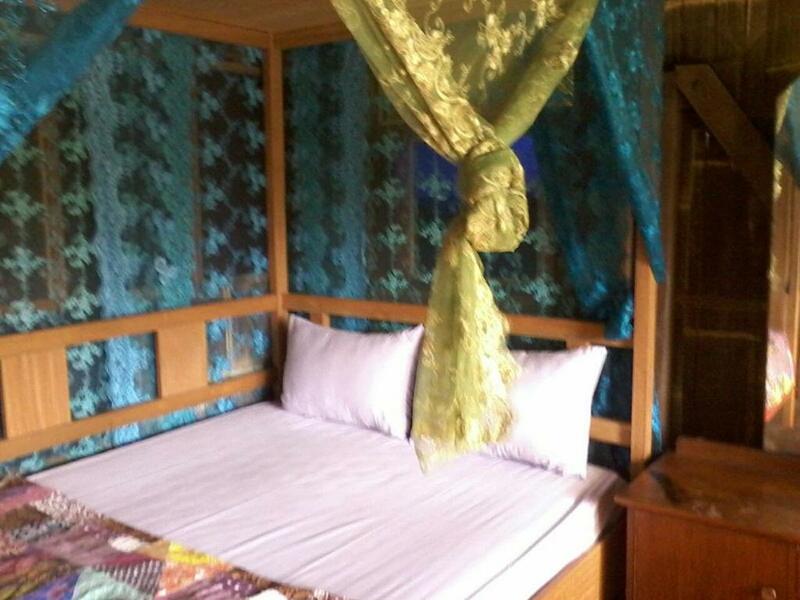 This is more like a Homestay than a hotel. 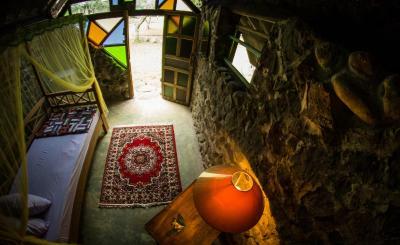 If you appreciate this style of accommodation, we highly recommend. It will be great if my bungalow is cleaned on daily basis. There was issue with water, but it was solved quickly. Overall, since I am a lover of nature and art, this is my place. I like the location, natural. The architecture is very nature friendly. It's by the river so I hear the river flow 24 hours. It is quiet as well. The people in this resort is attentive and ready to help. The breakfast is big. On the first day, I had Indonesian breakfast and second day I had breakfast with bread. For me the important point is the location and atmosphere. This is for those who like nature. Those who want to watch TV and be in AC room, this is not your place. Also the bungalow is open, so if you a type of person who has fear with silence, this is not also your place. This is really for those who like art and nature. 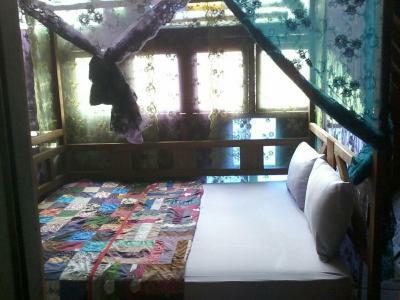 My room was upgraded to bungalow because the room has open bathroom and it was rainy season. 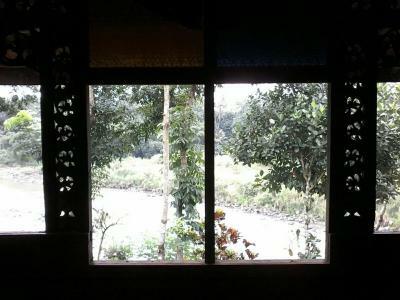 Location was amazing, peaceful, just the way to start a vacation, away from crowded place. Ibu Nur’s food was just amazing, and the wisdom and art of Pak Sony is just out of this world. Would definitely recommend this place. What a beautiful eco-place, created by a very special and talented artist, who used natural buildingmaterials for the whole place and all the fairytale-like houses. The location is really unique on the beautiful shores of a river with an amazing view. The location is a museum itself! :-) The food is very good and the hosts very special and friendly. 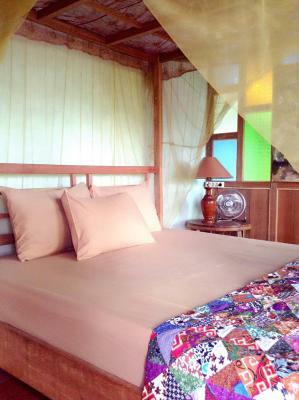 The place is also nearby Borobudur (5 min motorcycle or 15 bicycle wich you both can rent). I highly recommend this beautiful place! As in whole borobudur, you dont have to set an alarm, the mosques will do. Lodge was due to not having windows everywhere, nice airy but also some ants in there. 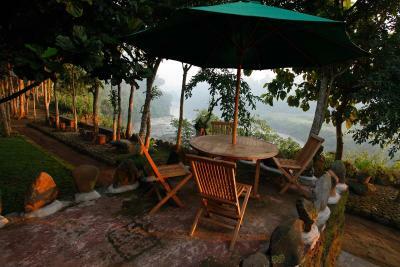 Perfect place to relax and to visit borobudur! Huge garden with nice views of the river. You can rent the bicycles for visiting borobudur itself and some other villages. Very friendly and easygoing oh and also a very good cook.